Detention centers are being prepared to process those who fall foul of religious codes. The Wi-Ha are a familiar presence in Indonesia’s northernmost region. 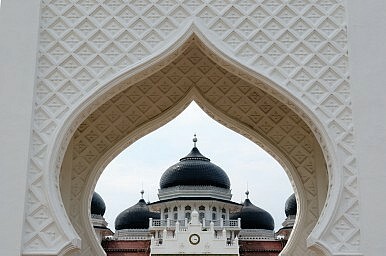 Following the Special Autonomy Law in 2001, Aceh’s provincial legislature enacted a series of qanun, or local laws, governing the implementation of Sharia. Since then, the enforcement of these qanun has largely been carried out by the Wi-Ha, who have functioned alongside the national police force for over a decade. Although the extent of the Wi-Ha’s legal authority during its history has, at times, seemed less than clear to members of the public, legislative developments over the past five years point towards an extension of jurisdiction, as well as a general increase in the number of Sharia-related offences being introduced. Decreed punishments for such violations also seem to have grown more severe, although their implementation is, in many cases, not carried out. In April 2009, two new and controversial qanun were passed, reiterating existing Sharia prohibitions, enhancing some penalties, and introducing an array of new offences. The new laws authorized punishments that included up to 60 lashes for “intimacy,” up to 100 for engaging in homosexual conduct, and death by stoning for marital adultery. These laws still stand today and, with the new Qanun Jinayat passed on December 13 last year, the Wi-Ha have new powers with which to enforce them. Previously, the Wi-Ha could only search and detain suspects briefly. After having been “educated” about Sharia principles, a process notoriously vague in its phrasing, perceived offenders had to be released if the official police had not been involved. Now, the Wi-Ha can detain suspects for up to 30 days prior to a legal trial. This period can then be extended for a further 30 days should the awaited trial be delayed. Zulkarnain has also indicated that those awaiting trial could be transferred to regular jails should the detention centers become overcrowded. What is the significance of these new developments? The general implementation of Sharia is not necessarily controversial for many Acehnese. Despite anger voiced by some of the younger generation at recent restrictions on clothing and public intimacy between unmarried couples, and despite some viewing the Wi-Ha as a public nuisance, many individuals support the religious principles that underlie Aceh’s strict legislature. However, international observers and human rights groups in the past have pointed towards the scope for abuse and selective implementation that these laws can afford. The report also contained testimony from “suspects” who had undergone physical and sexual abuse from Wi-Ha officials, as well as attacks from members of the local community upholding and encouraged by the 2009 codes. One female even claimed to have been raped by the Sharia police who arrested her before being released the next morning. Although these suspects escaped prolonged detention, the gender imbalance shown in this single incident suggests that women may well find themselves disproportionately affected by the December ruling. Human Rights Watch said that their 2010 report “details evidence that the laws are selectively enforced – rarely if ever applied to wealthy or politically-connected individuals.” It seems being male may also help one escape time in a new Wi-Ha detention center. Rob Yates is a writer based in North Sumatra.